Ontario has made major progress towards reducing deaths due to circulatory, cancer and respiratory diseases, and more Ontarians are surviving into old age, but the gains experienced differ substantially across regions, according to public health policy researchers at the University of Toronto. Ontarians in health regions that include the greater Toronto and Hamilton areas are healthier than those living in Northern and Eastern Ontario. 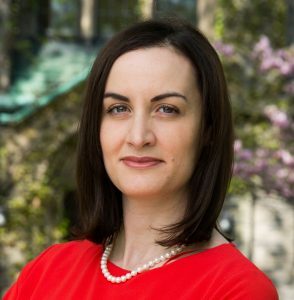 “Despite the progress made towards reducing early death in Ontario, there are certain regions in the province that may not be benefiting fully from Ontario’s health system improvements,” said Laura Rosella, Assistant Professor of Epidemiology at the Dalla Lana School of Public Health. On February 21, 2018, Rosella and her Population Health Analytics Laboratory team published the “Ontario Atlas of Adult Mortality, 1992 – 2015: Trends in Local Health Integration Network,” which outlines all deaths in Ontario between 1992 and 2015. The Atlas analyzes “premature mortality,” or deaths before the age of 75, which are largely preventable. Between 2006 and 2012, researchers found that half of premature deaths were potentially preventable. Ontario’s public health and health-care systems have made progress in reducing premature death through policies aimed at preventing chronic disease, such as Smoke-Free Ontario, which aims to achieve the lowest smoking rates in Canada. Gains have also been made in treating people with chronic conditions, such as advances in coronary heart disease treatment and improvements in diabetes management. Health researchers and policy-makers have long known that geography, gender and socioeconomic status profoundly impact health, but this Atlas shows significant variability in declines in death rates across the province. Ontario shows an overall 34 per cent decline in mortality, with health regions that include the greater Toronto and Hamilton areas experiencing the lowest mortality rates and largest improvements. However, Northern Ontario and regions outside Kingston and Ottawa have the highest mortality rates and showed little or no improvement. 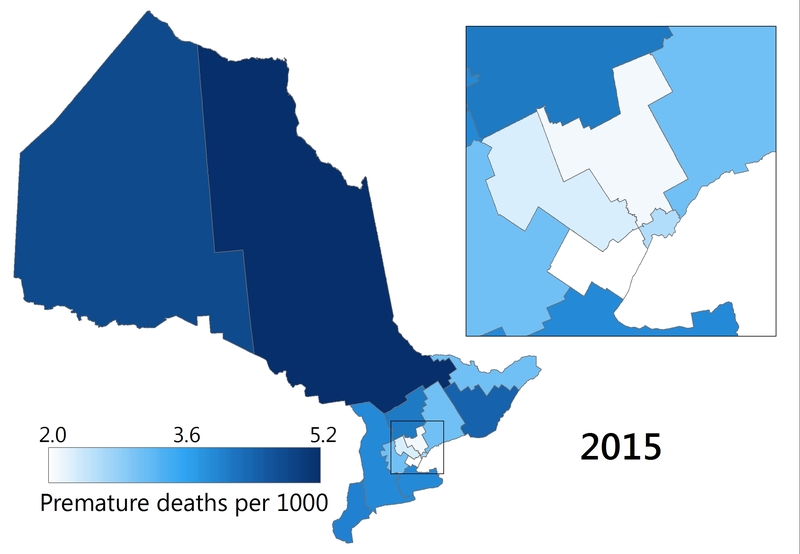 “Using maps to visualize mortality trends in Ontario was a very deliberate choice. 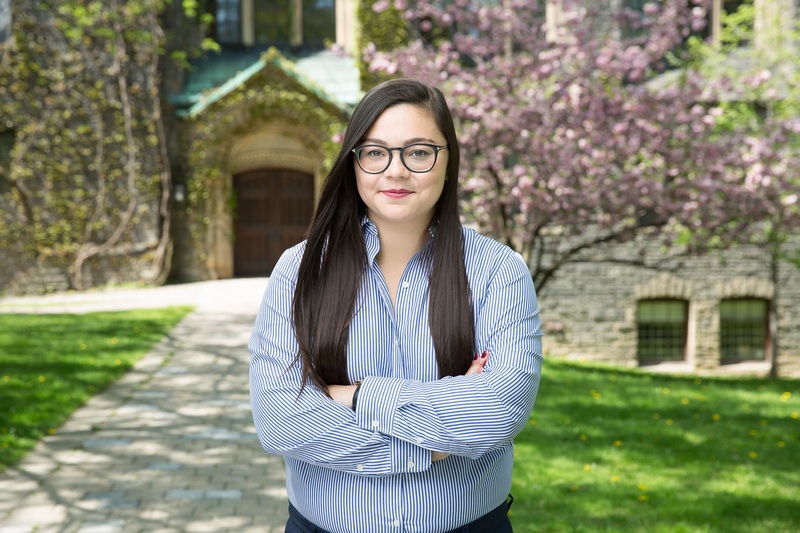 Not only do the maps send a clear message about what geography means for Ontarians’ health – we also hope that they will create the opportunity for stakeholders to engage with mortality in new, exciting ways,” said Emmalin Buajitti, an MPH candidate in Epidemiology at DLSPH who worked on the project with Rosella. “The more socioeconomically disadvantaged the area, the higher their risk of premature death. We’re seeing that as premature mortality rates in Ontario decline, not all regions of our province are benefiting,” said Rosella, who is also a Scientist at Public Health Ontario and the Institute for Clinical Evaluative Sciences. The areas that are most deprived continue to have the highest rates of premature deaths and there is evidence of a greater inequity over time. Females in North East and North West LHIN experienced no improvement in premature mortality between 1992 and 2015 (compared to 19 per cent improvement in Ontario females and 33 per cent improvement in Toronto Central LHIN). To reduce premature mortality and close the gaps in health disparities within the province, Rosella says a clear plan with targeted goals and investment are needed. “A strong vision with clear goals aimed at reducing early deaths and closing the geographic and socioeconomic gaps in population health should be something that government, municipalities and health organizations to get behind,” said Rosella. The Ontario Health Atlas was funded by a Canadian Institutes of Health Research Operating Grant. Professor Rosella also holds the Canada Research Chair in Population Health Analytics. Is it time to re-​think our “Canadian” health system?